How should you handle chemicals? How much of all that you do depends on the materials you use and how much you use. So before you even assess the risks you need to know what you are using. Look around at all the chemicals you use. Are they all properly labelled? Do you have safety data sheets for each? Do you need ventilation? Do your staff need protective clothing? Do you need help? Wright Safety Solutions can help you identify the chemicals you use; ensure you have all the necessary information and that all chemicals are labelled and packaged properly, and stored correctly, as required by the CLP regulations. The CLP Regulation adopts the EU classification and labelling of chemicals; applies directly in all EU member states (replaced the CHIP regulations 2015). Wright Safety Solutions can guide your business through the relevant stages of COSHH and CLP compliance. If your workplace is using chemicals then as well controlling their use you need to provide for the welfare of your employees. PPE: protective gloves, glasses, clothes and provide facilities for washing and eating, provide medical checks, and take appropriate precautions to prevent fires with the flammable chemicals. All these activities can result in contact of chemicals with skin, face, eyes, clothes and inhalation into lungs. Employers have a duty to protect employees, ensure chemcals are handled safely, provide information on chemical hazards and ensure that any incidents are dealt with quickly and efficiently. Employers have a duty to investigate the dangers of chemicals they use, determine the hazard they can present to employees, and put in place controls to minimise risk to employees. Many chemicals are flammable, and this applies to chemicals containing solvents like acetone, alcohols, hydrocarbons. 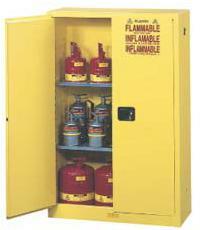 There should be no naked flames near containers of solvents nor near areas using flammable solvents. Cans of cleaning solvent should be kept in suitable storage cabinets. COSHH assessments are risk assessments which are required to determine if chemical risks are being controlled. The assessment should look at how particulr chemcials are used and establish what precautions are necessary in the workplace e.g. ventilation or protective equipment. Material Safety Data Sheets (MSDSs) contain much useful information but it can be difficult for non-scientific people to understand them. Wright Safety Solutions has many years experience with chemical and paints, can conduct COSHH assessments, do a full review of all chemicals used in industrial processes and workshops, explain the MSDSs and advise on engineering solutions and protective equipment.